Ever since that Surbiton garden was torn up for Geraldine the goat, having a smallholding has been symbolic of a simpler, happier lifestyle. Yet Tom Good of The Good Life was only harking back to an earlier time, when most people kept a pig and a few chickens. The brave new urban lifestyles that blossomed in the 20th century severed our links with where food comes from, but, today, as people retreat from the recession and seek earthy satisfaction, even city gardens are home to the odd chicken coop or beehive. Some 50% of the CLA’s members own less than 100 acres and NFU Countryside, which supports those with more than a garden but less than a farm, has 60,000 members. The kind of crops you grow and which animals you keep will depend to a large degree on how much land you have and the quality of the soil. Consider how much time you can give to your smallholding-if you have a full-time job that means most work is done at evenings and weekends, don’t grow anything that needs constant attention. Start small and expand as you become attuned to the lifestyle, rather than kitting out every corner of your acreage and finding yourself falling asleep at your desk because you’ve been pulling up potatoes all night. As smallholdings have risen in popularity, so courses have proliferated. You can learn about any aspect of it, from lambing to cider-making, but a general one is ideal for newcomers. The Empire Farm in Somerset offers a one-day introduction to running a smallholding, costing £75 (www.empirefarm.co.uk; 01963 371681), and Mumbleys Farm, near Thornbury, Gloucestershire, offers taster days and weekends, from £95 (01454 415296; www.mumbleysfarmhouse.co.uk). Kate’s Country School offers various courses at Great Trerhew Farm near Abergavenny in Wales, famous from the BBC’s Lambing Live (01873 821585; www.katescountryschool.co.uk) and there are two-day courses in Devon at South Yeo Farm West, near Okehampton, priced at £175 (www.smallholdertraining.co.uk; 01837 810569). There’s a surprising amount of red tape involved, even if you only own two goats. You’ll need to register with Defra (0845 933 5577; www.gov.uk/defra) and also be awarded a County Parish Holding number, without which you won’t be able to move any livestock onto your land. The Rural Payments Agency (0845 603 7777; www.rpa.gov.uk) and the CLA (020-7235 0511; www.cla.org.uk) are vital contacts. Visit a farm on the annual Open Farm Sunday (June 8, 024-7641 3911; www. farmsunday.org). Some 365 farms around the country open their gates and you can take the whole family. 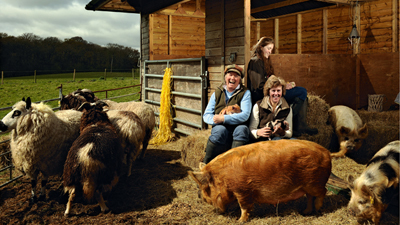 For a more extended taster, book a holiday on a farm through Farm Stay UK (024-7669 6909; www.farmstay.co.uk). Accommodation varies from luxury tents to converted barns and you can try your hand at lambing, feeding the pigs and milking the cows or goats. Rosemary Champion, who has a smallholding in Angus with fruit and vegetables, Shetland cattle, coloured Ryeland sheep, pigs and hens, and runs the website The Accidental Smallholder (www. accidentalsmallholder.net) tells newcomers what to expect. Spend your days tending native and rare breeds, such as Oxford Sandy and Black pigs and Guernsey goats, before exploring nearby beaches or the charming town of Llandeilo.